Trusting your gut is important as a designer. It's that confidence that everyone working in the industry is trying to build—the ability to define an aesthetic. For Portland, Oregon-based stylist, Liz Kamarul, trusting her gut has become an essential part of her design process. In her 1,200 square foot home, there are moments—gut checks—where Kamarul gets it just right, following her instincts to create a one-of-a-kind space. "Inspiration for our home came from the couch in our living room. All the color and patterns led to a design that has no rules or limitations." "It always comes back to the couch," remarks Kamarul, about one of the more special pieces in her home. "It was the turning point in my design and taught me to listen to my gut and let go of any doubts or cares about what other people like." A riot of pattern and hues, including black, white, yellow, red and pink, for many, a mod sofa like this would be a gamble, but for Kamarul it feels right at home. "I found it at a home staging consultation and the owner gave it to me. It's a very special piece." With a focus on creative styling in her home, Liz has incorporated some unexpected details in the interior. 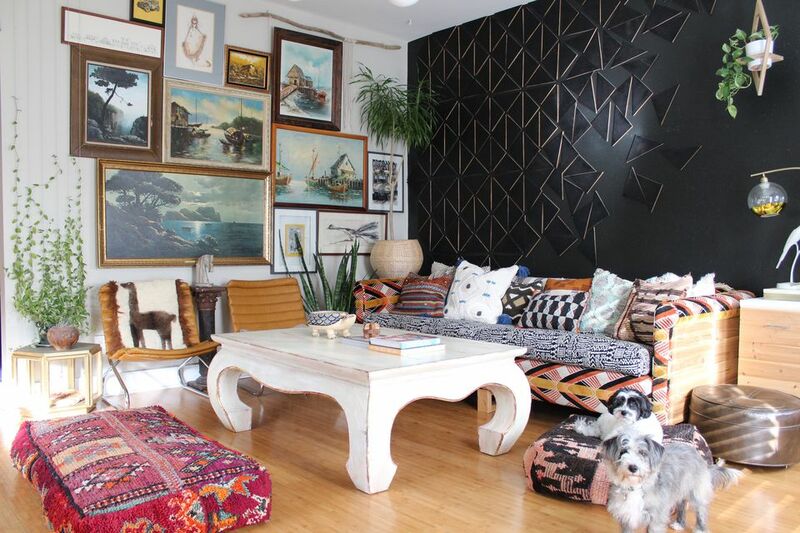 "I love the black wall in our living room." Texture has been added to the dark wall with a fun DIY project. "It's made of wood triangles that we spray painted and nailed to the wall. It adds just the right amount of texture and interest without competing with the gallery wall next to it." The home's gallery wall is a beautiful moment. A quiet pause that invites one to look deeper. The mix of paintings offers a look at a dark, moody sea. The painted scenes are a reflection of Portland life, living in a city surrounded by water. Against another living room wall, Kamarul has carved out a colorful spot to relax in. The color palette is reflective of the vibrant colors found in the home's one-of-a-kind sofa. The daybed is made even cozier with a combination of kilim pillows and handwoven poufs beneath. Beyond the black living room you enter the home office. The transition offers a deep contrast, as the space is painted a bright white. Raw wood beams cover the ceiling and have also been used to create the desk. The bright, rustic space is dotted with modern elements, including a leather and chrome stool as a unique desk side chair, and a globe pendant. "The lighting in our home is from Rejuvenation," remarks Kamarul about the stylish pendant. "I'm obsessed with all of their items." Throughout the interior, a collection of plants also adds to the natural feel of the space. Among the handwoven pieces, rustic woods and eclectic elements, greenery contributes to the feeling of warmth in this home. It's clear that Kamarul has a green thumb, as plants shine in every corner. The bedroom features of mix of tactile elements. Everything has a texture to it. Something that's a key component of Kamarul's aesthetic. Among the cozy knitted blankets and rag rug cushions, rough wood is a key backdrop in the bedroom with a handmade headboard. To complete the bedroom vignette, gold and black wallpaper has been brought in. The final note—a painting that is reflective of the sea reflects the pieces on the living room gallery wall. The kitchen is a beautiful mix of contrasting shades. White tile meets a dark black ceiling. The tiles are a perfect backdrop for the wood elements, like the kitchen island, that truly shines in this space. For Liz, the open-plan shelves in the kitchen are the perfect place to display a collection of glassware, bowls and serving pieces. The honey shelves pop against the white subway tile that covers the kitchen walls. To make the pendant light from Rejuvenation stand out in the kitchen, Kamarul got creative. A handwoven rug acts a unique ceiling medallion in the space. It's definitely an unexpected use of a rug in an interior. And the idea pays off. Another gut response that Kamarul nails in this interior filled with innovative ideas. Color and pattern also stand out in the home's dining nook. Flamingo wallpaper is a final whimsical touch in this home filled to the brim with unexpected touches that work to great affect in this PDX home.